Kodama, C., St. Jean, B., Subramaniam, M., & Taylor, N. G.
Research poster to be presented at iConference 2016, Philadelphia, PA, March 20-23, 2016. Follman, R., Kodama, C., Taylor, N. G., Subramaniam, M., St. Jean, B., & Casciotti, D.
Research poster presented at the Maryland Association of School Librarians 2014 Annual Conference, Linthicum Heights, MD, October 17, 2014. 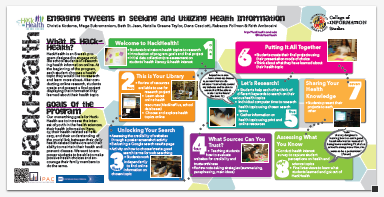 Kodama, C., Subramaniam, M., St. Jean, B., Taylor, N., Casciotti, D., Follman, R. & Ambrosini, F.
Participating tweens improve their health literacy skills by looking for and evaluating online health-related information so they can use this knowledge to make smart and healthy life choices. In addition to learning about a specific health topic of their own choosing, students learn about different aspects of digital literacy. Subramaniam, M., St. Jean, B., Follman, R., Taylor, N., Goldberg, G., Casciotti, D.
iConference 2014, Berlin, Germany. March 4-7, 2014. This poster presents preliminary results from a National Library of Medicine (NLM) funded afterschool program that aims to increase tweens’ interest in health and health science, their health literacy, their health-related self-efficacy, and their awareness of the important connection between their everyday health behaviors and their ability to maintain their health and prevent disease.